There's a lot to like about marketing automation, and nearly every marketer you ask will tell you they expect automation to increase efficiency. In fact, this study by Forrester says 83 percent of marketers believe it will do just that. But that same study warns against putting too much emphasis on efficiency. Why? Look at it this way. Say you get stuck in traffic at the same place everyday. The red light up ahead doesn't seem to change fast enough and it's not timed properly with the other lights on the street. You could talk to your neighborhood group about the problem, petition your city councilperson to do a traffic study, and hope that the changes (probably months or years down the line) result in improvement. Or you could get a bike. Two solutions for one problem: A long, process-filled solution or one that lets you weave around the obstructions and change paths at a moment's notice. When you're using marketing automation, you have the same choice. You can focus on productivity gains through setting up processes that involve sales, legal and support, among other departments. Or you can develop a team of trusted digital marketers who can follow the rules of the road but pivot when the automation needs adapted to new circumstances or new data. Marketing automation isn't easy. In fact, the more you use it, the more complex the system becomes. If you're using marketing data to set goals, then you need the ability to adjust your tactics based on that data in order to make incremental improvements over time. That's where you start hitting red lights. Traditionally, getting content like a press release or a brochure approved has been a long process. It involved everyone from the legal to sales to product managers to customer support. Even in today's non-stop world, marketing teams can face the same reviews that slow down content creation (the fuel behind marketing automation) and distribution . So what do you do? When building the strategy for marketing automation, you need to set your long-term road map, one that has buy-in from all relevant parties. At the same time, your marketing team needs to make tactical improvements when the data dictates. This is where the agile development methods of software companies meet the lean manufacturing techniques used by large-scale operations. And it's how marketing should evolve. You've convinced everyone at the company that marketing automation is the way to go. You're done, right? Unfortunately, no. Much of your effort will be focused on building trust with the other departments your work directly affects. Sales: You want to deliver qualified leads to your sales team. That's the whole point. Before you can successfully do so, you need to ask very specific qualifying questions. What size company is it targeting? What type of budget is necessary for someone to become a customer? Anything that could qualify or disqualify a lead needs to be determined collaboratively. Legal: Legal review is inevitable, especially in highly regulated industries. Ask legal how much time they need to properly review content that you are using in your automation. And be kind to these folks. Don't drop a load of content on them all at once. It only makes them less likely to provide appropriate feedback to make the process efficient in the future. Product Management: Just like a legal review, it’s a best practice to have the product teams review your marketing materials. Bring them into the process early so they can help you with the specifics of the product. Then make sure they have a proper review, asking them how much time they need for approval. Customer Support: Anything you say in your marketing can and will be used against your customer support team. And marketing automation only increases the amount of content that could result in customer questions. While the product manager is a great resource, a talk with support can help you refine the language you use. Buy-in is important in order to make your marketing agile. And the truth is, it's an organizational change as much as it is a change for your marketing department. Building the necessary trust to make it happen can take time, but in the end, it’s worth it. 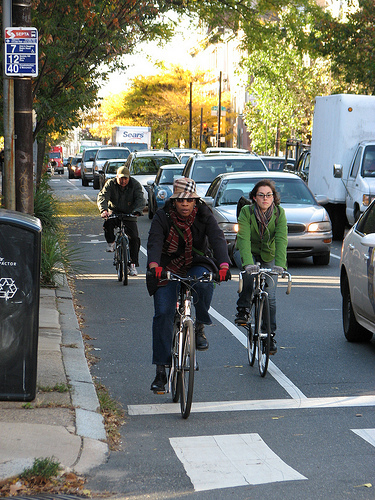 Because if you do, you can go from riding your bike around traffic to building a bike lane.